The Crushing and Pressing occurs in September/October, the Racking (removal of sediment) occurs in February and the Bottling occurs in May/June. The Crushing and Pressing occurs in April/May, the Racking (removal of sediment) occurs in October and the Bottling occurs in February/March. The Chilean varietals we offer are limited to six (6): Cabernet Sauvignon, Cabernet Franc, Merlot, Syrah, Malbec and Carmenere. The South African varietals are limited to three Cabernet Sauvignon from three different regions within South Africa. The regions are: 1/ Breede River Valley Region, Breedekloof District, 2/Olifants River Region, Lutzville Valley District, and 3/ Coastal Region, Stellenbosch District. Have you ever wanted to learn how to make your own wine? At Grape Expectations you can! Established in 2005, Grape Expectations opened their doors to the public in February of 2007. 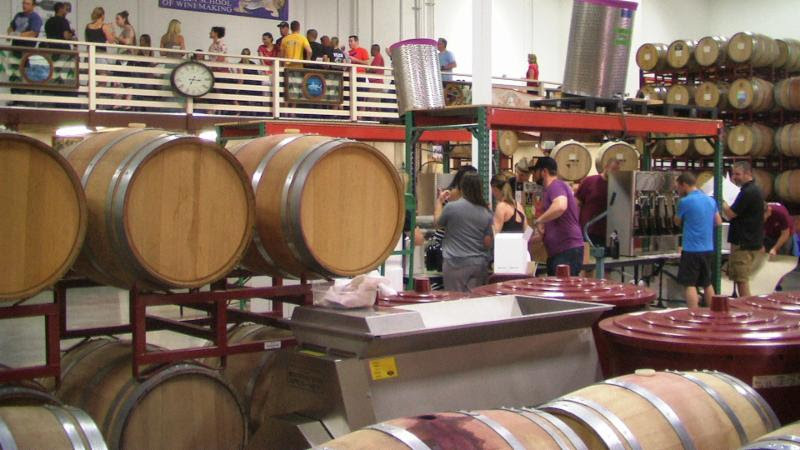 The first of its kind facility in the State of Nevada, Grape Expectations takes you through all the processes in a fun and rewarding atmosphere. 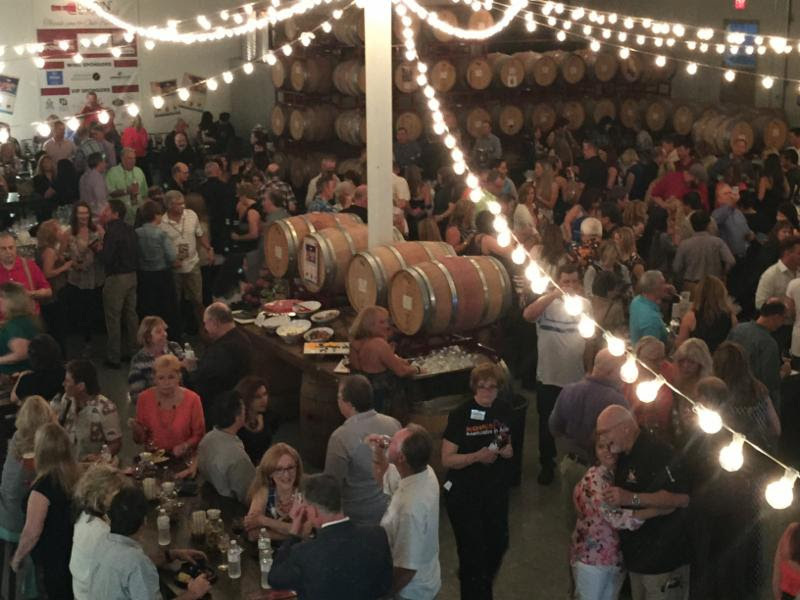 At the end you will have great memories, winemaking knowledge, and quite a few bottles of your own privately labeled wine! Customers who visit Grape Expectations will begin on the ground floor of the winemaking process, choosing grapes grown in California or Chile. When the grapes arrive, patrons will find 756 pounds of grapes just waiting for another unique winemaking experience. 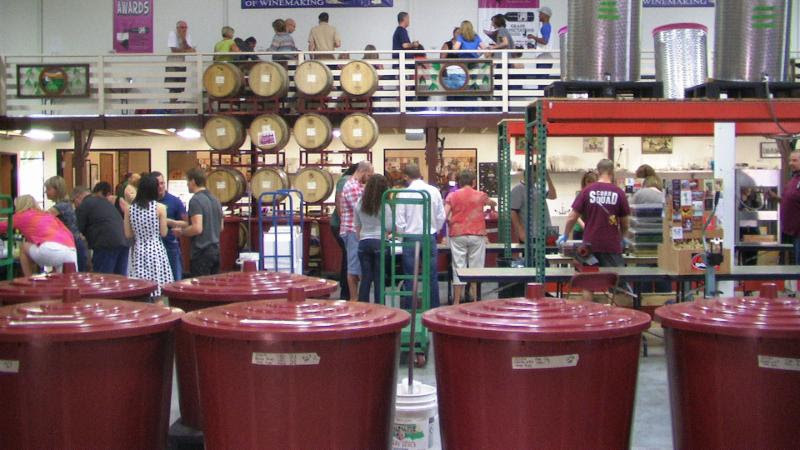 A barrel yields 240 bottles of wine, which customers can adorn with their own personalized labels. It doesn’t matter if you decide to make a barrel of wine by yourself or you decide to include friends and family to offset the cost; the price for a barrel of wine remains the same. On your initial visit Mike, KJ or Chad will go over your “Grape Expectations”, varietals, styles, equipment, procedures, session scheduling and answer any other questions you may have. It’s a bad day to be a grape. After a lesson in the operation of our state of the art equipment, you will load your selected grapes into the crusher/de-stemmer. The ‘must’ (crushed grapes) will then be pumped into a fermentation tub and the primary fermentation will be initiated. Adjustments and measurements will be made and the session will continue with a discussion of the effects of yeast and maceration during the process. One week after primary fermentation begins; you will return and press the juice from the ‘must’. 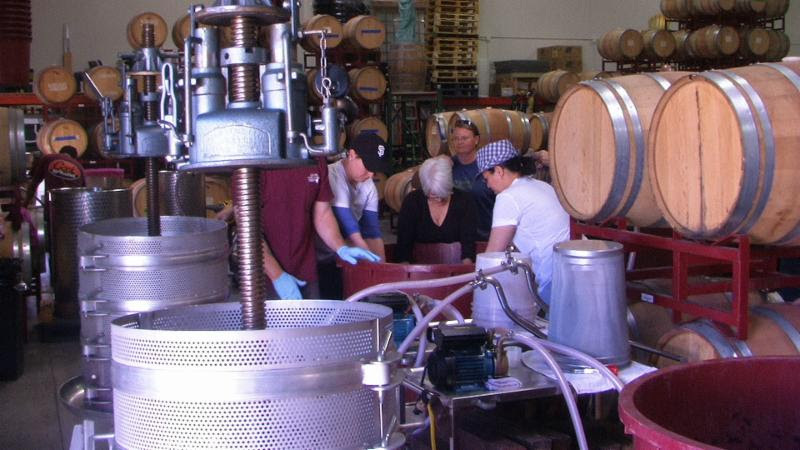 This process utilizes a traditional hydraulic wine press, not the “I Love Lucy” grape stomp. Your friends will thank you later. The free run juice and press juice is pumped into a 53 gallon oak barrel to start the aging process. After a few months (generally after the holidays), you will return to rack the wine. During the racking process, the wine is pumped into a stainless steel tank. The lees (sediment) are washed from the barrel and the wine is reintroduced into the freshened barrel where the final aging process continues. The barrel is topped off and then put back into storage. For your final session, and with the aid of a gravity-filler, you will load the wine into sterilized bottles, cork the bottles with a manual press and finally, shrink wrap a decorative, protective capsule on the neck of your 240 bottles of joy. You can now enjoy the fruits of your labor…the work may be over, but not the fantastic memories! With your permission, 2 bottles of wine are held back for inclusion in a blind taste testing conducted in July by the American Wine Society. As a result of their findings an Awards Dinner is held and chosen winemakers receive gold, silver and bronze medals in all categories of judging. The dinner is truly a “Knife, Fork and Cork Feast-ival”. It’s great fun for anyone with a passion for winemaking. Grape Expectations is open for business and signing up new customers throughout the year. 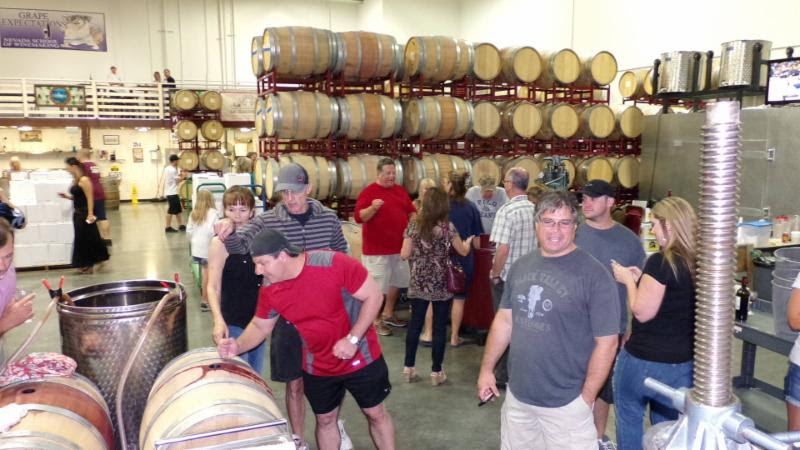 Mike, KJ, Chad and Patty are extremely flexible and happy to schedule a private tour of the facility at any time and date that is convenient for you, just give us a call at (702) 806-3383. Our hours vary, please call (702) 806-3383 prior to visiting to be sure we are available to assist you. Where are we Located and how do I get there? Should you have any questions, please feel free to contact Mike, KJ, Chad or Patty at 702-806-3383.